Is it too early to be thinking about December holidays? Swiss grocery stores say “no.” In fact, they were thinking about Christmas way back in August. Here’s a display from the Baden Migros grocery back in September. 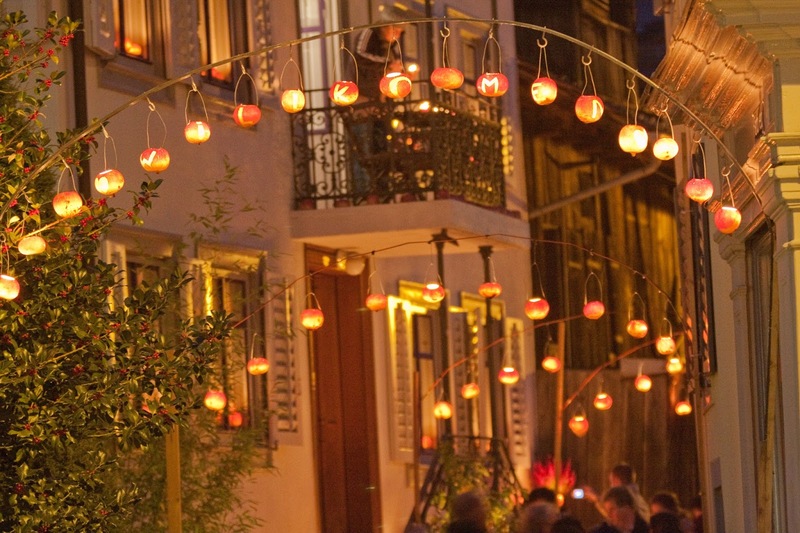 Every fall in Switzerland there’s a pumpkin paradise just waiting to be discovered. It takes place at Jucker Farm, a working farm where towering sculptures made from pumpkins can be enjoyed along with some chocolate and cinnamon-roasted pumpkin seeds and fresh apple cider. There are two Jucker Farm locations in Northern Switzerland: Seegräben and Jona. Both are wonderful. At lunchtime, each farm restaurant offers a hot buffet with meats and pasta, a salad buffet, soups, sandwiches, flammkuchen, and desserts like apple strudel. The food is reasonably priced and very good—which makes finding a table difficult. On the scale of parades featuring flames in Switzerland, the Richterswil Räbechilbi (Turnip Lantern Parade) is quite tame. But what it lacks in risk it more than makes up for in its ability to celebrate normally ignored root vegetables. Think 29,000 kilograms of turnips (all grown locally), 50,000 candles, 1,100 participants, and 20,000 visitors (in a town of 13,000) and you’ll get the idea. When the Swiss combine the words “turnip” and “festival” they mean business. In fact, according to the Guinness Book of World Records, the Richterswil Räbechilbi is now the largest turnip parade in the world. This year's parade is Saturday, November 11 at 6:30 p.m. in Richterswil. 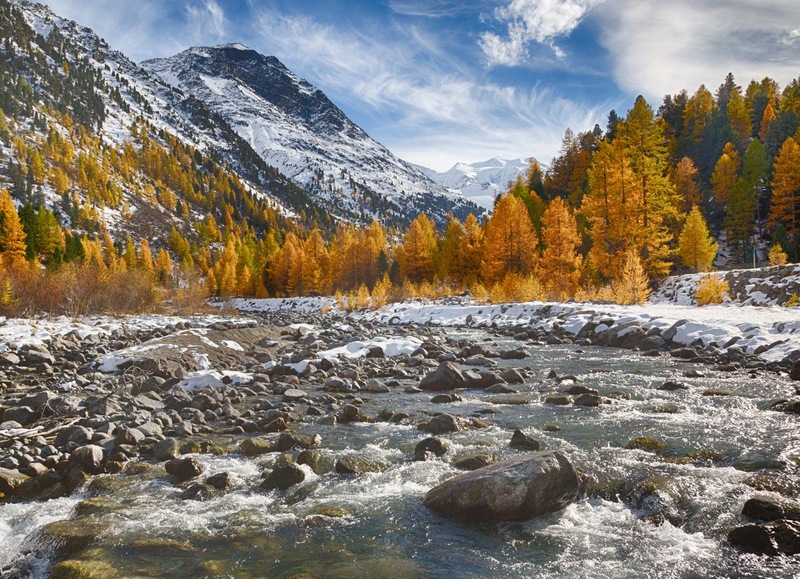 If The Frau had to choose her favorite hike in Switzerland, it would probably be the Morteratsch Glacier hike—especially if it’s mid-October. There are several reasons for this. One is the sheer beauty of orange and yellow larch trees framing the icy snow and the (hopefully) blue sky. 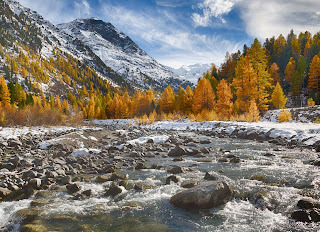 The Engadine area is famous for its autumn colors, and not without reason. Two is the length (approx. 5-6 kilometers, 1 hour 40 minutes total) and ease of the walk (fairly flat, on a mostly wide and graveled path), which allows one to admire the scenery without being distracted by blisters or aching muscles. Three is easy access. The hike begins and ends at the Morteratsch train station, whose neighbor is the Hotel Restaurant Morteratsch—a relaxing place for lunch. P.S. 96.9 more ideas for un-touristy fun are included in The Frau's second book, 99.9 Ways to Travel Switzerland Like a Local, which was published in May. It makes a great Christmas gift, at least for those of you already buying Lebkuchen at the Migros. I was planing to visit Switzerland and dint know what is the must visit place or what's so happening there.Thanks for this article,it would be so helpful for my visit to Switzerland.